Electron micrograph of a milk fat globule. Here’s where the action is. This has so far been the most challenging post to research and write; there’s a lot of arcane and incomplete knowledge on the topic, much of it of questionable relevance to the mission of artisanal ice cream making. If you favor recipes with one or more egg yolks per liter of base, and don’t want extra homework, you can skip this one. If you’re interested in making egg-free ice creams with the best possible texture, or are just a glutton for minutia, read on. An emulsifier is a two-faced molecule that binds to water on one side, oil on the other. You’ll see one side labelled hydrophilic, the other labelled either hydrophobic or oleophilic—different jargon, same idea. The adage that oil and water don’t mix still holds true after all these years. This would be a problem for much of the world, especially the plant and animal parts, if it weren’t for emulsifiers helping to hold things together. Like, for instance, milk. Milk is a colloid made from a polar chemical (water) and non-polar chemical (milk fat), which cannot mix. Technically speaking, they are not miscible. But they can form an emulsion—a more complex arrangement in which immiscible ingredients coexist, with some degree of stability. Because it’s an emulsion, Milk is creamy, opaque, and homogenous. The fat molecules are divided into many microscopically small globules, which are surrounded by emulsifying chemicals that keep them from glomming together and rising to the top. These emulsifiers include fatty chemicals called phospholipids, and proteins called wheys and caseins. We’re mostly interested in the caseins, which make up about 80% of the milk proteins. They gather together in clusters called micelles, which expose their hydrophilic and hydrophobic surfaces on different sides, allowing them to bind both water and fat—thereby keeping the milk from separating.1 If you look at milk under an electron microscope, you see big round fat globules, covered in a thin membrane of casein micelles. This casein, with its hydrophilic end facing outwards, keeps the fat globules connected to the water and discourages them from joining each other. Milk Fat and Casein. Click to enlarge. Center: crystalized fat. Crystals protrude, but casein prevents them from bumping into other globules. so the fat globules are better able to bump into each other and form a larger structure. Thanks mostly to the casein, milk and cream are already pretty stable emulsions—so why are emulsifiers so important in an ice cream recipe? The reason is that the milk and cream emulsions are a bit too stable. A big part of making ice cream involves the same process as making whipped cream, which requires destabilizing the emulsion. As long as the emulsion is stable, those fat globules can’t join to create a foam network. With traditional methods, you can only whip cream containing over 30-something percent fat. With lower fat percentages, there’s enough water between the fat globules to keep the emulsion stable. Ice cream usually has far too little fat. This is what added emulsifiers are for. They weaken the emulsion, by binding to some of the existing emulsifiers (casein micelles) and carrying them away. This allows the protruding fat crystals from from different fat globules to make contact and form a network. The result is ice cream to whip into a foam more easily, and with better texture and stability. Egg yolks may be the most familiar emulsifier in the kitchen; they hold together mayonnaise, hollandaise and béarnaise family sauces, Caesar’s salad dressing, and chocolate marquises. Yolks are usually cooked to a custard consistency, which also thickens the water portion of the ice cream (as a stabilizer—see the post on Ice Cream Stabilizers). Yolks are occasionally used without taking advantage of their thickening ability, but they must at least be cooked to the point of pasteurization. Yolks contain a number of proteins and lipids that work as emulsifiers. By far the most important among these is lecithin. For adequate effect on ice cream emulsification, the mix requires 0.5% to 1% egg yolk. This equals 1/3 to 2/3 yolk per liter of mix, so a single yolk is more than adequate. 2 yolks (3 to 4%) are necessary to get significant thickening / stabilization. For the richest French custard-style ice creams, 4 to 6 yolks per liter is more common, with 8 to 10 being close to the outer fringe. I would consider anything with 10 yolks per liter a frozen custard rather than an ice cream. Custard texture and flavor will dominate, or at least will compete heavily with everything else. The following are useful primarily if you’re making ice cream without eggs. Egg-free ice creams can be lighter, can have more vibrant flavors and a cleaner finish, and of course will be completely without egg flavors (although ice creams made with as few as two yolks per liter have essentially no egg flavor). Eliminating eggs can be especially useful in ice creams that have a lot of extra fat from the flavor ingredients: chocolate, nut butters, avocado, etc. With these flavors, eliminating eggs is a way to to avoid the flavor damping and greasiness that can come with too much total fat content. Lecithins are complex mixtures of fatty components derived either from eggs or soybean oil. They allow egg-free ice creams to be made with the same, all-natural emulsifier used in custard ice creams. Soy lecithin is as effective as egg lecithin and costs less. A single “large” egg yolk contains roughly 1.5g lecithin. An egg-free recipe can be made with 1.5 to 4.5g lecithin per liter (0.15% to 0.45%) Higher quantities may be helpful in recipes with lots of added fat. It’s possible that in very delicately flavored ice cream, lecithin will have a detectible flavor of its own. I haven’t found this to be the case (I’ve tried straight soy lecithin out of the jar and found its flavor much milder than milk powder). Flavor may vary with the quality grade of the ingredient. Seek a high quality, very refined lecithin that has a mild flavor, and always disperse it thoroughly in a powerful blender. is similar to skim milk powder, but has a greater number of phospholipids that have emulsifying power. There’s some research into using this ingredient in place of traditional emulsifiers. I haven’t seen research on ice cream specifically, so I can’t recommend quantities or techniques. In larger quantities, it will of course taste like buttermilk. Buttermilk flavored ice cream might be good for first experiments. While the health scares you’ll read the internet are imaginary, I can’t find much compelling reason to use polysorbate in artisanal ice cream. Its advantages over lecithin and egg yolks are in cost and and improved whipability. Cost is a minor issue in small volume production, and most high quality ice creams are intentionally dense (low overrun) and so don’t need improved whipping. If you’d like to experiment, standard concentration is between 0.02% and 0.04%. These are emulsifiers which occur naturally at very small concentrations in seed oils. Commercial products are manufactured, using a glycerolysis reaction between triglycerides and glycerol—components of fats from either plants or animals. This ambiguity concerning their source gets them flagged by some vegans, although there is no chemical difference in the end product. Unlike sorbitan esters, glycerides are believed to be most active at the fat-air interface, helping the ice cream form a finer-textured foam. I have not seen this confirmed by studies. Because they naturally form together, the mono- and di- versions are usually used together and packaged together. The monoglycerides, however, are thought to be the functional component. These typically make up about 40% of the blend. It’s also possibly to use monoglycerides by themselves which are usually isolated to glycerol monostearate (GMS) or occasionally glycerol monooleate. These work in much smaller quantities but are more expensive than the usual mon- / di- mixture. Versions of mono/diglycerides are sometimes packaged for chefs as “glycerin flakes,” although this is a bit of marketing nonsense, since there’s no glycerin in there. The vendors are fighting the bad reputation of ingredients that are manufactured or hard-to-pronounce. There is plenty of internet hysteria about emulsifiers—most of it dreamed up by charlatans like the Food Babe who deserve your active contempt. If you’d like to experiment, standard concentration is comparable to lecithin: between 0.1% and 0.2%. 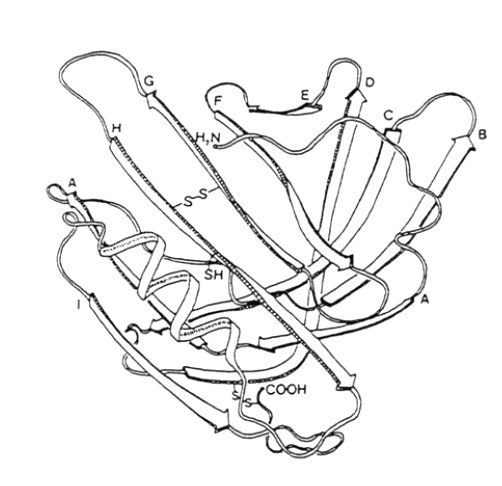 3-D diagram of a ß-Lactoglobulin whey molecule. When it denatures (cooks), it unwinds. Whey proteins make up about 20% of milk’s protein content, vs. Casein’s 80%. Whey is much less stable than casein when exposed to heat. At temperatures that are typical for pasteurizing ice cream and thickening custard, whey proteins begin to denature—they unfold from their original shape, exposing previously concealed surfaces to the molecules around them. Another culinary term for using heat to denature proteins: cooking. When the whey proteins denature, they expose rows of active, hydrophobic (water-hating / oil-loving) molecules to other proteins and fats they encounter. There are several different types of whey proteins in milk, all of which react differently to different temperatures and environmental conditions when they unfold. In other words, this is complicated. Not only is my own understanding of the science imperfect, but the science itself, with regards to ice cream, is immature. Here’s what we know: different types of whey protein denature at different temperatures. They partially denature over time above 60°C / 140°F. They don’t fully denature until they reach 90°C / 194°F or higher. When they fully denature, some may form insoluble aggregates that are harmful to the ice cream’s texture. When they partially denature, they develop different kinds of molecular attractions. Some of them are attracted to the casein micelles. When they bind to the casein micelles, they form stronger bonds than the casein’s original bonds to the fat globules. When enough of this happens, the emulsion partially destabilizes—which is exactly what we use all those other emulsifying ingredients for. Other denatured whey proteins are attracted to each other. At some temperatures they begin to form aggregates that make a gelatin-like network in the water phase of the ice cream. Which is to say, they behave like a hydrocolloid stabilizer (see the post on Stabilizers). What this tells us: we can, in theory, use partially denatured whey proteins as both an emulsifier and a stabilizer. Some industrial manufacturers, like Haagen Dazs, appear to get all of their stabilization from the whey proteins (although they use eggs as emulsifiers). Others, like Jeni’s Splendid, get all of their emulsification from the whey proteins (although they use starch as a stabilizer). In both cases, partially denatured whey proteins probably play a role in the ice cream’s body and texutre. How much whey do we need? That’s unclear, but a recipe that’s high on nonfat milk solids is essential. You’re not going to get enough from straight milk and cream. I’d suggest adding nonfat dry milk powder to raise the milk solids into the 10% range (which will improve the ice cream for many unrelated reasons as well). What’s the optimum time and temperature to get these effects? It’s somewhere between 60°C and 90°C, half a minute and 90 minutes. There is no published definitive research on this, and what exists probably expresses ranges with varying characteristics and tradeoffs. Back when Jeni’s made their egg-free bases in-house, in a big batch processor (as opposed to a continuous processor, which is more common in dairies and manufacturing plants), they cooked it at 75°C for an hour. That’s a relatively low temperature and a very long time. I cook my ice cream at 75°C for 30 minutes, plus 15 minutes for it come to temperature—for a total of 45 minutes in a heated water bath. This works well for my methods—but I’m not counting on the milk proteins for everything. I use gums to stabilize, and a couple of yolks (or some lecithin) to emulsify. I’m only counting on the proteins for some added body and smoothness. And you may need to cook different portions of the whey at different times and temperatures, to optimize them as both stabilizers and emulsifiers. It’s possible to make ice cream with just cream, milk, and sugar, skipping the eggs and everything else. The result is called “Philadelphia Style,” although it doesn’t appear to have any roots or any particular following in Philly. This name may be the coinage of a 19th Century Journalist who needed a catch-all for East Coast ice creams that aren’t French. This is good news for the citizens of Philadelphia, since the name is rather slanderous. Philly-style ice cream can have vibrant, clean flavors, but it pays for them with a litany of texture defects: it’s icy, it rapidly gets icier, it whips poorly, the foam structure lacks smoothness (it can be grainy) and lacks stability (it deflates). Some people champion this style, and they’re lucky, because it’s easy to make. But I can’t think of other reasons to recommend it. Egg yolks work really well. If you don’t want the flavor of eggs, or the flavor-dulling of heavy custard, you can use just a couple of yolks, or as little as half a yolk. If you really want to banish egg entirely, lecithin works nicely. I make eggless ice cream bases for flavors like chocolate and nut butters, where the flavor ingredients add tons of their own fat. In these cases a bit of lecithin (equal to what’s in two or three eggs) and a bit of extra stabilizer takes care of the emulsion perfectly. If you want to delve into the more efficient manufactured ingredients, there’s a world of glycerides and polysorbates to play with. See the ingredient sources listed in the Stabilizers post. If you find any advantages to these ingredients in Artisanal ice cream, I’d like to hear from you. You can also take advantage of the natural emulsifying power of cooked whey proteins. The whey’s already there, and you’re already cooking the mix, so why not take advantage? Generally, the emulsifying and stabilizing power of these proteins will be enough to supplement the more conventional ingredients, rather than replace them. It may be possible to replace the conventional ingredients entirely, although there’s only one reason to do so: “label friendliness.” For retail ice cream, the ingredient list has become a marketing document, and therefore a place to play to the whims of an often-uneducated public. As long as people believe locust bean gum is somehow less natural or less desirable than tapioca starch—even though it’s a superior ingredient—manufacturers will feel pressure to use it. Or to use nothing at all. Denaturing the whey proteins provides a way—even if somewhate ironic and cynical—to use science in the service of pretending your ice cream is as science-free as Grandpa’s. Never mind that Grandpa’s ice cream was never all that good. The idea of Grandpa’s ice cream, in all its nostalgic splendor and purity, has created a standard everyone with a retail label aspires to. If you’re making ice cream at home or in a pastry kitchen, you’re lucky. You can use the ingredients that make the best product, without concern for labels and mythology. For you, getting some emulsion and texture control from the whey proteins isn’t mandatory—it’s just the cherry on top. 1Eventually, milk will separate. Fresh from the cow it will separate over time just from gravity (fat is lighter than water) or faster if put in a centrifuge (the way dairies separate cream from skim milk today). Emulsifiers make an emulsion relatively stable, but not perfectly so. We can add stability by thickening the water portion of the emulsion (we call anything that does this a stabilizer) or by breaking the fat globules up into a greater number of smaller ones. This physical process is called homogenization. Most of the milk we buy has been run through a high-pressure homogenizer, which blasts the fat globules into a bajillion nano-sized ones—they’re so minute and plentiful that the emulsion stays stable almost indefinitely. 2Full coalescence would mean whipping the cream into butter, which we’re not trying to do. Emulsifiers in Food Technology Robert J. Whitehurst. The egg yolk base came out perfectly, but unfortunately the soy lecithin base had a clotted appearance and an extremely grainy texture. I've seen it mentioned elsewhere that graininess in recipes using lecithin could be due to insufficient shear force. But, I did homogenize the base after cooking with a vitamix for >1 min. Any other thoughts on what might cause this? Any thoughts on soy lecithin vs egg yolk powder? Would using the egg yolk powder just reintroduce the eggy flavor thus defeating the point? Hi Paul, sorry -- I missed your response and can no longer recall the details of my recipe. Any idea when more recipes will be posted? It's been a while! I will emailing the spreadsheet with some info to your [email protected] shortly. Yeah, it won't whip up much. And you're likely to get an icier texture, because all else equal, it will take longer to freeze. So, certain amount of crystallization is necessary during aging to prevent full coalescence of the fat droplets(which results in one large fat globule), but complete crystallization prevents any coalescence from taking place because of their rigidity. Because of that, we need to aging to make proper amount of crystallization. The emulsifiers generally do not directly effect water crystallization, although they can effect it indirectly by encouraging a fine foam structure, which may help keep ice crystals separate. But we mostly look to the stabilizers for this purpose. And sometimes (like with egg yolk) the same ingredient works as both emulsifier and stabilizer. We don't use emulsifiers to prevent fat from coalescing. The fat needs to partially coalesce in order to whip into foam. The emulsifiers we use in ice cream actually weaken the milk fat's natural emulsification, to help with this process. Counterintuitively, we use emulsifiers as de-emulsifiers. The ripening process is to chill the mix long enough and cold enough for the fat globules to crystalize (or partially crystalize—for structural reasons, they crystalize at many different temperatures, which is why some butter is harder than others at the same temperature). The fat needs to be crystalized to coalesce and whip, so you can't skip this step. Chilled mix also freezes faster, which will improve the texture. It's less clear how long you have to chill the mix. The term "ripening" suggests that all kinds of magical stuff happens, which I've never seen any support for. Some people have said the amount of time is unimportant, as long as you chill the mix enough. Hi, thank you for the nice article. I was studying about how the emulsifiers work, and I concluded that it prevents fat from coalescing each other and prevents water from crystalization. I am back to making ice cream as a hobby after a year off and I have started a blog mainly for beginners. Is it ok if I link this for resources? I don't want to have to go over the components of ice cream structure when you have a great series here. FYI, if you are looking for a spreadsheet, I wrote one when I started learning how to make ice cream myself last year. It has remained WIP for the last gajillion years but it tunes sweetness, freezing point depression, solids etc and I have a table of main ingredient weights that are pulled from google, nutrition labels and USDA website mainly. Should we prefer liquid lecithin or powdered? Do you know if they have any differences in the final product? Hi Anonymous, thanks for writing. Glycerol monostearate is the mono-glycycerol part of "mono- and diglycerides." And it's the part that does most of the work in ice cream, according to what I've read. So there should be little functional difference between using this ingredient and usual mono- and di- version, which is itselfl identical to the version labelled "glycerine flakes." Your observations about textures and skin formation in creme anglaise are interesting. I've never experimented with this. I've also never had issues with oiliness or skin formation on anglaise or custards. ive been doing some research on ice creams and youve given me a detailed idea on how they work, i am currently doing some research on a high protein ice cream using whey protein, from what i understand proteins act as emulsifiers, and since the fat content is low in whey the result would be an icey texture, would there be a way to still make a creamy texture using the primary ingredient as whey protein? I haven't. Lecithin flavor is usually a factor of its quality. The better brands are too mild for me taste in any ice cream. I've been using Will Powder brand with good results.